Cumin's use for fortifying love is also represented in certain Arabic traditions in which a paste of ground cumin, pepper and honey is thought to have aphrodisiac properties. In large skillet, drizzle extra virgin olive oil, over medium heat. Add ground beef, breaking meat up as it cooks. Cook meat until brown. Spoon off excess grease. Add onions, garlic, chili powder, paprika, cumin, salt, pepper and Worcestershire sauce. Stir well. Add fire roasted tomatoes. Stir in cooked rice. Preheat oven to 350 degrees. Clean bell peppers, remove seeds and cut into half lengthwise. Place bell peppers on baking dish. Spoon meat mixture onto bell peppers. Place bell peppers in oven for 10 minutes. Enjoy! 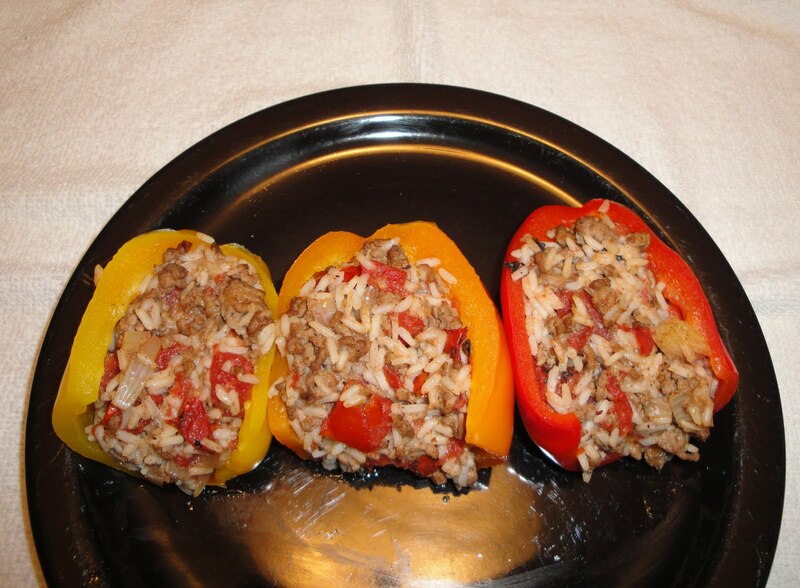 I was just thinking of making this very thing in mini peppers :-) Love stuffed peppers. Your recipe looks great. Thanks for all the interesting info on cumin. Interesting and delicious recipe. I made Tuna Stuffed peppers the other night. They were easy and really good. Not sure why I don't make stuffed peppers more. They always turn out with a lot of flavor. Stuffed peppers are so good! Love your recipe. I have been incorporating more and more cumin in my recipes lately. I enjoy the slightly smokey flavor it adds! Sounds yummy! I love stuffed peppers! Love the Worcestershire in there! Yum! I am not a fan of stuffed peppers. But they have to be one of my Mom's favorite dishes! She would love this! Your comment made me giggle. Thanks for stopping by. Hugs! These look pretty and sound delicious. I love using fire roasted tomatoes. I was happy to see Aldi now carries fire roasted tomatoes... love fire roasted tomatoes. Delicious! Cumin is one of my very favorite spices! When I make chili and similar dishes, I'm heavy on the cumin and light on the chili powder! I love cumin, thanks for the history lesson! I just made stuffed peppers too :) Yours look wonderful! Cumin is the number in my kitchen, everything esp with cooking veges, I tend to add it for the benefits and fragrant. Lovely outcome with the peppers you have done. A delicious looking recipe and interesting facts to digest too! I love this kind of food. I love this recipe for stuffed peppers, especially the cumin, It gives a lot of dishes, that smoky, warm flavor. I do love some cumin....though paprika is up there in spice love for me too. Nice recipe. Very pretty and I love finding new ways to use cumin. I can smell the aroma of the stuffed peppers with cumin. I've given you an award, please checkout my blog. Congrats! Very pretty Christine - my kids would love these stuffed peppers, as would I! Thank you so much. I'm happy and honored. Again, thank you. These look great. Cumin is my second favorite spice. Garlic is easily number 1 for me. Absolutely liked the flavor combination u used. It looks colorful and spicy yum! I have not had stuffed peppers in years, these sound delicious. Cumin is also one of my favorite spices, lots of great info on it. Your peppers look just lovely. I just love red and yellow peppers! Even more so when stuffed with a tasty rice combo! Congrats on the Top 9, Christine!!! I LOVE cumin! Just marinated some chicken breast with cumin ;-)) Those stuffed peppers look so pretty and flavourful. I love cumin and peppers and your post is very informative and looks great and the combinations sound and look sublime thank you and keep up the good work. Thank you so much! I appreciate you and your comments. Pretty! I'm keeping my eyes peeled for peppers at the market today! I always get an education when I drop by your blog. Thanks for sharing. My mum makes stuffed peppers and I absolutely adore them. Your version sounds very intriguing - will have to try it your way next time!